A vehicle that combines transportation and temporary living quarters for travel, entertainment and outdoors is called a Motorhome. In other words, a Motorhome is a vehicle designed for recreational use, as in camping. There are many benefits of owning and traveling in an Motorhome such as convenience, comfort, family appeal, affordability, the lure of the outdoors and adaptability. Motorhomes come with all the facilities such as kitchen, king-size bed, a washer and dryer, television set, recessed lighting, a double-wide refrigerator, and a working fireplace. The people who cannot afford an Motorhome for them, the Motorhomes are available on the rent. People with Motorhomes can stay overnight which is commonly known as Motorhome park or RV stop. More and more RV parks are expanding each year that provide many facilities. In the United States, more than 355,000 recreational vehicles are sold every year globally, under which motorhomes contributed 58.2% of the total sales in 2016. Goldstein Research analyst forecast that the recreational vehicle (RV) unit sales are expected to reach 850.0 thousand units by the end of 2024. Globally, motorhomes are becoming popular in nature-based tourism as people prefer traveling through their own private transportation. Manufacturers shipped 446,000 RVs in 2017 and 430,691 in 2016 across the globe. However, recreational vehicle players are experiencing considerable demand from fleet owners for motorhomes. Rising trend of traveling to hill stations by own transportation is driving the motorhome market worldwide. ​​​​​​​On the basis of application, leisure motorhomes are having the highest market share of 56.8% in 2016. Increase in camping and travel usage. In the United States, recreational vehicle owned households have grown to a new peak of 8.9 million households, up from 7.9 million in 2005 and 8.5% of the United States households now own at least one RV’s. Whereas, the market share of the business motorhome is growing steadily at an annual growth rate of 19.60% due to rising trend of mobile offices, medical clinics, isolation units, bathrooms and showers, laundries, bunkrooms, command centers, and classrooms. Based on geography, North America dominated the global motorhome industry with the market share of 41.2% in 2016 due to growth in travel and tourism in the United States. The United States recreational market rose with an annual growth rate of 4.8% in 2016 as compared to the growth in 2015. On the other hand, Asia-Pacific motorhome market is growing steadily with a CAGR of 10.0% owing to increase the interest of young and old generation in motorhomes. With the increase in technological advancements and high-tech featured motorhomes, the population living in major economies such as China, Japan, India, Australia and New Zealand are spending more and more in motorhomes. According to our global market study on the basis of extensive primary and secondary research: “One of the major trends in the global motorhome market is the eco-retro motorhome where the vehicle is fitted with solar panels to power it’s onboard accessories and a computer and GPS-system will position the panels to maximize their solar-intake and the kitchen will swivel, allowing for meal prep inside or out. In addition, the introduction of the luxury motorhomes which includes the bar, wine cabinet, and icemaker, large screen TV, to the Italian bed linens and adjoining spa with a glazed rainfall shower” are also gaining traction among the end-use consumers and travel companies. According to the report, major driving factor for motorhome market is the increase of travel and tourism, especially among the younger generation. The shipments of the motorhome is increasing and is expected to grow more each year, for instance, sales in the first quarter rose 11.7% from 2016. Further, the report states the major challenge is the high cost of the motorhomes in both the terms to travel as well as to own it. The maintenance, cleaning, loading, and unloading are very expensive. There are many hidden costs such as some motorhomes are not structurally sound, for instance sometimes sunlight and poor weather can damage the roof of motorhomes. The report covers the present ground scenario and the future growth prospects of the Motorhome market for 2016-2024 along with the new product launches, collaborations, and acquisitions by the market players. We calculated the market size and revenue share on the basis of revenue generated from major players across the globe. Moreover, our analyst forecast the growth of the industry on the basis of current market trends, research and development activities, emerging markets and traditional markets. Motor Home Market Report by Goldstein Research has been prepared based on an in-depth market analysis from industry experts. The report covers the competitive landscape and current position of major players in the global motorhome market. The report also includes Porter's five force model, SWOT analysis, company profiling, business strategies of market players and their business models. 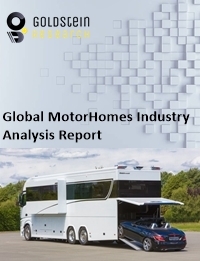 Global motorhome market report also recognizes value chain analysis to understand the cost differentiation to provide a competitive advantage to the existing and new entry players. Our Motor Home Market Report comprises of the following companies as the key players: Eclipse Motorhomes Inc., Gulf Stream Coach Inc., Northwood Manufacturing Inc., Palomino RV, Thor Industries Inc., AL-KO AXIS, Allied Recreation, Aliner and Somerset Folding Camping Trailers, Augusta RV, Coachmen Motorhome Company, Cruiser RV and DNA Enterprises. Other high-flying vendors in the market are Fleetwood RV, Forest River, Forks RV, Freightliner Custom Chassis, Grand Design RV, Lifestyle Luxury RV, Little Guy Worldwide, Navistar RV, Newmar, Pleasure-Way Industries, Prime Time Manufacturing and Renegade RV. For a full detailed overview, send us a request for motorhome market report sample. What is the revenue of motorhome in 2015-16 and what would be the expected demand over the forecast period?